that July day on the Isis, as they called the Thames at Oxford, Ina's command that Dodgson tell them a story and that he start it right then came to him as an intrusion. Dodgson had fallen into a strange mood that afternoon. It may have been something about the quality of the summer light, with the sun playing with the trees and the river as they rowed along, that gave this particular moment a heightened clarity. It's possible, too, that "Row Row Row Your Boat" with its suggestion that life is only a dream had come into his head. In any case, his state of mind that day on the water was such that next to the vividness of the present instant, life as he ordinarily knew it didn't seem altogether real to him. At those times that he put on C.L. Dodgson's clerical hat and strove earnestly to live up to established expectation, conventional social life could be all too real a reality. But not today. Compared to the immediacy of this floating moment on the Isis, the modern world was a distant dream. Victorian England, a dream. Oxford and Christ Church, just a dream. But if familiar life as he usually knew it seemed a dream to Dodgson just then, what was he able to take as real? In every time and place there have been people with a conviction that ordinary human social life isn't as substantial as it appears to most of those who live within it, and that somewhere just beyond our grasp there exists a realer reality which is more perfect and complete and closer to the essence of things. But mid-Nineteenth Century Europe, dedicatedly materialistic and fact-minded and intoxicated by the visible progress and power of modern Western civilization, was a particularly challenging cultural context within which to be otherworldly. Dodgson had felt most in contact with another more wonder-filled order of existence when he was a boy living in an isolated country parsonage in Daresbury and his younger sisters and brothers were still very small or had yet to be born. Playing by himself, it seemed that anything that he could conceive might be true. That special feeling of being alive in a magical realm of infinite possibility was connected in his mind with the light of summer, so that when he remembered his childhood, it could seem a "fairy-dream" to him -- "bright, beyond all imagining" -- and he could long to be a child again on a beautiful summer day. But as Dodgson had grown older and become enmeshed in the demands of the adult social world of time and obligation, the door to heightened experience which had been open to him as a little boy had begun to swing shut. If he sought out the company of children it was because he valued their innocent truthfulness, their ability to love without reservation, and their immediate receptivity to novelty and wonder. He envied that openness, and he strove to keep the door to wonder ajar for himself through association with the freshness and honesty of the young. It was more difficult for Dodgson to perceive a reality beyond the one he saw immediately around him when he was a grown-up living in Oxford within the shadow of the great city of London. However, he did manage to find two avenues that led from things as they presently were toward things as they potentially might be. These were the theater and photography. As a newly independent Oxford don in 1855, during the same Long Vacation in which he began to write for Comic Times and also looked on while his Uncle Skeffington experimented with his recently acquired photographic equipment, Charles went to see a play. His father might expressly disapprove of the professional stage, but this was Shakespeare and so Dodgson had the excuse that it was uplifting. He found himself enchanted by what he saw. After that first experience, he declared that he'd never enjoyed anything so much in his life. He wrote in his diary: "I almost held my breath to watch; the illusion is perfect, and I felt as if in a dream all that time it lasted." The theater offered him an opportunity to see beyond the visible surface of existence. It showed him things he couldn't ordinarily witness, and expressed thoughts and sentiments that his own uncertain tongue could never utter. He returned to the theater again and again, and he would continue to go as long as he lived. It was the public C.L. Dodgson's greatest rebellion against the authority of his father. This form of adult imaginative play quickly became a necessity for him. Dodgson would find his way backstage and satisfy some of his curiosity about stage mechanics and effects. He would faithfully read and collect The Theatre from its first issue, and even contribute to the magazine himself. And he would form an important continuing friendship with Ellen Terry, a well-known young actress he had admired since she appeared as a child in two of the earliest plays he attended. Eventually, he'd even send several aspiring, talented young girls to live with her as dramatic apprentices. The stage was so essential to Dodgson that if he had been asked to make a choice between his position at Christ Church and the theater -- as for years he thought might happen -- he was never certain which he would finally choose. In a similar way, Dodgson was attracted to photography by the ability of a picture to reveal things that are not usually apparent. From an early moment, he recognized that it was possible for a well-composed photograph, taken with care and then effectively framed, to show a deeper level of human existence than the eye can normally perceive. He wanted to be able to do that himself. Making a photograph at all in that era was a difficult and complex process, with each step subject to chance and mishap. Many of the pictures that Dodgson took failed. When he did manage to obtain a good likeness, true to the appearance and spirit of the sitter, he could count that a considerable success. Every now and then, however, with the intervention of some mysterious element that he might hope for but could never control, the picture that Dodgson so painstakingly produced turned out to be something more than just an accurate representation of a particular person. His camera was able to penetrate beyond the specific details of the time and place and subject to capture an image that was eternal and enduring and not merely of the moment. This rare result happened most often in photographs of children playing for the camera. 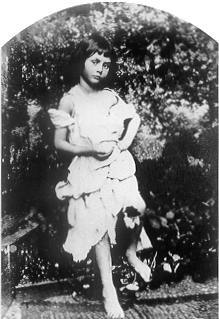 He had taken at least three pictures of Alice Liddell that had this timeless quality -- once dressed as a beggar child leaning against a wall, once sitting sideways pensively on a wooden chair outdoors, and once perched on a draped table with a potted fern to her right and an expression on her face that was innocent and trusting yet unfathomable. But life also seemed to present Dodgson with barriers at every point which baffled him and kept him at a distance from the wonder he sensed. He might try to hang onto the experiences and perceptions of his childhood but he wasn't an innocent child any longer. While he could remember what it was like to see things by a certain light, most of the time he wasn't able to see things that way himself. In his adult years, the theater or a photograph might still sometimes serve as a window into another order of reality for him. But between the audience and the wonders they witnessed on stage there was always an invisible gulf. And a photograph, even at its best, was an indirect image -- like a view of freedom that a prisoner can glimpse in a carefully placed mirror, but never directly, and only when the light is right. Dodgson often had difficulty sleeping at night, kept awake by questions and doubts. In those troubled hours, it was possible for him to feel that there was nothing of substance to any of the things he loved, and that everything he cared about most deeply was only something he'd dreamed. The magic he'd experienced as a child and was able to perceive at times on the stage or in a photograph was completely intangible. It existed in memory or in the eye of the beholder. There was no way for Dodgson to prove it to anyone. As time passed, his convictions on this score would only grow stronger. Eventually, he would declare: "My view of life is, that it is next to impossible to convince anybody of anything." Dodgson's way of getting through his sleepless hours was to embrace the things he loved all the more strongly, simply because he loved them. Love -- not mere sentiment or romantic love, but the genuine love of anything worthy -- was a fact that held a central importance for him. In his eyes, love had its own validity. It was an inner recognition that was true simply because it existed. He aimed to live by "the spirit of a maxim I once came across in an old book, 'Whatsoever thy hand findeth to do, do it with thy might. ' "
That was a lesson to be learned from children. They had the natural gift of loving whatever they found to love uncritically and wholeheartedly. To those able to emulate the young, he would suggest that "the best work a man can do is when he works for love's sake only, with no thought of name, or gain, or earthly reward." The object of this love might be anything that lifted the spirit. Dodgson loved the look of the light at that moment in the boat on the river. Something in him stirred to see it. Its bright golden gleam was like a knock on the door of Charles Lutwidge and a call for him to come out and play. A sample of that light could never be trapped in a bottle for analysis. And yet, to him it was magical. The repeated invocations of love made by Dodgson could be intensely discomfiting to anyone for whom immediate social reality is all that exists and only quantifiable fact can be true. Nobody would ever go so far as to call his abiding love for a certain kind of golden summer light directly into question. And if again and again, he associated light of this sort with his most visionary moments, that would be allowed to pass without comment. But a time would eventually come when there would be an attempt to discredit Dodgson's description of the light on this one particular afternoon on objective scientific grounds. Almost ninety years after this day, The Observer of London made a request that the weather records for July 4, 1862 be checked. The answer it received said that it had been cool at Oxford and that during the twelve hours after 2 o'clock in the afternoon, there was an accumulation of .17 of an inch of rain. And more than one scholar or annotator of the mid-Twentieth Century would bow before the power of this information, invoking it as the real truth which unfortunately must trump Lewis Carroll's fond but demonstrably inaccurate memory. But one thing that a weather bureau does not do is record the tonal quality of the light on a given day. For that, our best witness must be Charles Dodgson. Not only was he there, but he also had a photographer's eye for the character of the light. This was a man who even at his most playful would insist that anything he told you three times was true. And on at least three occasions over a span of more than twenty years, he would consistently describe the afternoon as golden. Alice Liddell Hargreaves would also remember the day as a beautiful one. And this testimony from two people who were actually present in the boat that afternoon isn't to be set aside simply on the basis of someone's eventual interpretation of old weather records. It almost seems possible that both versions could be true. Golden light sounds like slanting sunshine bursting through the clouds. On an in-and-out English summer day, Oxford could have been persistently shadowed and comparatively cool. There might even have been a shower. At the same time, a few miles away on the river, it is possible to imagine the sun finding a hole in the clouds and the weather being altogether brighter and warmer. That was just the opposite of what had happened during the last river outing the same group had made several weeks earlier. That time, they'd gotten drenched by a sudden rain, and Dodgson had led them to a house where a friend had lodgings to dry themselves out. "I can call it up almost as clearly as if it were yesterday -- the cloudless blue above, the watery mirror below, the boat drifting idly on its way, the tinkle of the drops that fell from its oars, as they waved sleepily to and fro. . . ."
Ultimately, there is only one thing we can take as indisputable. A state of mind which was usually only a memory to Dodgson could be triggered by a certain kind of bright summer light. And even though he might no longer be a dreaming boy lying all alone on a silent hill, on this particular day there was something about the quality of the light he was experiencing that he recognized and responded to. In this light, anything seemed possible. Something more wonderful than life ordinarily allows might be waiting just around the next bend in the river. Extraordinary things could happen. "May we not then sometimes define insanity as an inability to distinguish which is the waking and which the sleeping life? We often dream without the least suspicion of unreality: 'Sleep hath its own world', and it is often as lifelike as the other." Could he be in that other world now? Was it possible that he was asleep and this vivid moment on the river was only a dream? He certainly felt as though he were somewhere other than usual. And yet, at the same time, what he was experiencing was completely convincing to him. Just now, and in this magical light, it was ordinary daily life that seemed like a faraway dream. So which of them was the dream and which was real -- the mundane Victorian world or this golden moment? Or was it necessary to make a choice between the two? If life did have more than one aspect, might it not be possible for both states to be equally real but for each to appear as a dream to the other? Both of them true at once, separate and distinct -- yet also somehow intimately connected? After all, the waters on which the gig was riding now could simultaneously be the workaday Thames River and the mythic River Isis. And it was possible for him to be both stodgy C.L. Dodgson and playful Charles Lutwidge. Alternative modes of anything were fascinating to Dodgson, and all the more so when a variant displayed some wild quality that the familiar version lacked. He loved the ability of mathematics and logic to produce changes from one state to another. And he was attracted by any device or method of transformation which allowed him to turn everyday expectation on its head. He would obtain a distorting mirror and place it in his rooms. He practiced until he could write from right to left in reversed letters. And he liked to tinker with the works of the vast array of music boxes he owned in order to make them play songs backward. The children who visited him found queer things like this amusing. But to most adults they would be travesties of reality which deserved to be ignored. Dodgson knew better. For him, a strange reflection, wrong way writing, and a back-to-front song would be every bit as real, evident and meaningful as the more familiar versions. Not only did they exist -- and by the very fact of their existence demand to be taken account of -- but they would be a more compelling demonstration of the possibility of other modes of being than any argument he could ever make. It was even possible for him to imagine a mirror world in which things like this were completely at home. A song in reverse could sound normal there. To the inhabitants of such a place, it would be everything that we are accustomed to and take for granted, like writing from left to right, that would appear odd. So which was really the proper direction to write, and which was all wrong? Dodgson didn't know how to tell. Perhaps it was we who had things backward. And then, as the gig hung suspended between the cloudless depths above and the watery mirror below, Dodgson slipped into a state of even greater uncertainty in which he was no longer sure what was real and what was not. It seemed to him that any number of different modes of being could all exist, with each of them just as real or just as unlikely as the next. There was nothing specially privileged about our usual waking attitudes and assumptions. In his present state of mind, it was clear to Dodgson that if you looked at familiar daily life from outside with the eyes of a stranger, it wouldn't appear necessary and inevitable, but arbitrary and even humorous. Many other modes of being were possible. The mirror world, the realm of sleep, and the present floating moment were not the same as the ordinary waking state but were just as meaningful. And by existing at all, each of them laid claim to its own rightful place in human experience. Even when they seemed to conflict with each other, one state wasn't to be favored as more real than another. A dream at night had just as much or as little significance as the activities people pursue so single-mindedly each day. Every aspect of life was equally real -- or else all of them were equally a dream. Every bit of existence was a dream. And all of our experiences were part of that dream. That was how it was possible for there to be so many different states of perception and being. The dream just kept shifting from one set of circumstances to another the way that dreams do. And the dreams that we have at night were only one more phase within this larger dream. Having arrived at the fundamental insight that life is a dream, Dodgson would hold fast to it for the rest of his days. He would never distress himself or anyone else by insisting on this point, but on more than one occasion he would offer it as a question for others to consider. In the final words of the acrostic poem recalling this special afternoon that he placed at the end of Through the Looking Glass in 1871, Dodgson would ask specifically, "Life, what is it but a dream?"